80 percent of patients survive when kidney cancer is detected early – but it is often not easy. However, finding it early has been among the disease’s greatest challenges. Kidney cancer is the seventh most common cancer in men and the 10th most common in women, affecting about 65,000 people each year in the United States. About 14,000 patients die of the disease annually. Like most cancers, kidney tumors are easier to treat when diagnosed early. But symptoms of the disease, such as blood in the urine and abdominal pain, often don’t develop until later, making early diagnosis difficult. Now, researchers have developed a noninvasive method to screen for kidney cancer that involves measuring the presence of proteins in the urine. They found that the protein biomarkers were more than 95 percent accurate in identifying early-stage kidney cancers. In addition, there were no false positives caused by non-cancerous kidney disease. Funded by the Barnes-Jewish Hospital Frontier Fund and The Department of Anesthesiology at Washington University School of Medicine in St. Louis, with additional support from the Bear Cub Fund of Washington University, Barnes-Jewish Hospital Foundation and Washington University Institute of Clinical and Translational Science, with additional funding from the National Cancer Institute (NCI) of the National Institutes of Health (NIH). NIH grant numbers R01CA141521 and UL1 TR000448. A new paper notes that the Campanian Ignimbrite eruption in Italy 40,000 years ago, one of the largest volcanic cataclysms in Europe and responsible for injecting a significant amount of sulfur-dioxide (SO2) into the stratosphere, coincided with the final decline of Neanderthals as well as with dramatic territorial and cultural advances among modern humans. Scientists have long debated if this eruption and the resulting volcanic sulfur cooling and acid deposition could have contributed to the final extinction of the Neanderthals more than climate change or hominin competition. A new paper tests this hypothesis using a climate model. “While the precise implications of the Campanian Ignimbrite eruption for cultures and livelihoods are best understood in the context of archaeological data sets,” write Black and colleagues, the results of their study quantitatively describe the magnitude and distribution of the volcanic cooling and acid deposition that ancient hominin communities experienced coincident with the final decline of the Neanderthals. Citation: Benjamin A. Black et al., ‘Campanian Ignimbrite volcanism, climate, and the final decline of the Neanderthals’, Geology 19 March 2015, DOI: 10.1130/G36514.1. Studying the intricate fractal patterns on the surface of cells could give researchers a new insight into the physical nature of cancer, and provide new ways of preventing the disease from developing. This is according to scientists in the US who have, for the first time, shown how physical fractal patterns emerge on the surface of human cancer cells at a specific point of progression towards cancer. Publishing their results today, 11 March, in the Institute of Physics and Germany Physical Society’s New Journal of Physics, they found that the distinctive repeating fractal patterns develop at the precise point in which precancerous cells transform into cancer cells, and that fractal patterns are not present either before or after this point. The researchers hope the new findings can inspire biologists to search for specific “weak” points in the pathways that lead to the alteration of precancerous cells at this specific moment. By targeting these weak points, the researchers believe they could influence the process and thus prevent cancer from developing. Lead author of the study Professor Igor Sokolov said: “Despite many decades of fighting cancer, the war is far from being victorious. A sharp increase in the complexity and variability of genetic signatures has slowed the advancement based on finding specific cancer genes in patients. The term “fractal” defines a pattern that, when you take a small part of it, looks similar, although perhaps not identical, to its full structure. For example, the leaf of a fern tree resembles the full plant and a river’s tributary resembles the shape of the river itself. Nature is full of fractal patterns; they can be seen in clouds, lightning bolts, crystals, snowflakes, mountains, and blood vessels. Fractal patterns develop in conditions that are far-from-equilibrium, or chaotic–systems that are not in a state of rest or balance. 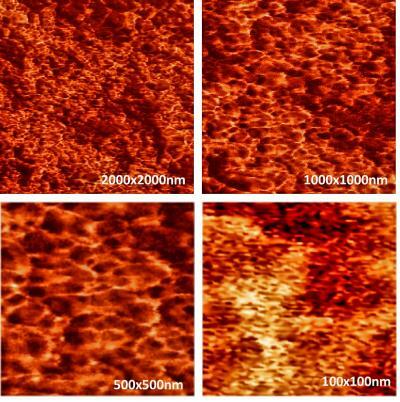 In their study, the researchers, consisting of Dr Dokukin and Prof Sokolov from Tufts University and Ms Guz and Prof Woodworth from Clarkson University, used atomic force microscopy to produce extremely high-resolution images of the surfaces of human cervical epithelial cells. The cells were studied in vitro as they progressed from normal cells to immortal (premalignant) cells to malignant cells. “Despite previous expectations that fractal patterns are associated with cancer cells, we found that fractal geometry only occurs at a limited period of development when immortal cells become cancerous,” Professor Sokolov continued. Whilst it is still unclear if the presence of fractal patterns plays any part in the development or progression of cancer itself, the researchers state that it is definitely plausible to expect that they have some importance given the role that the cell surface plays in metastasis. Professor Sokolov said: “When cancer metastasizes and spreads through the body, cancer cells have to physically crawl through multiple tissues, overcoming friction and resistance through interactions on the cells surface. The brain’s GPS wouldn’t be much value if its maps of our surroundings that were not calibrated to the real world – grounded in reality. But they are, and a new study shows how this is done. The way that the brain’s internal maps are linked and anchored to the external world has been a mystery for a decade, ever since 2014 Nobel Laureates May-Britt and Edvard Moser discovered grid cells, the key reference system of our brain’s spatial navigation system. Now, researchers at the Mosers’ Kavli Institute for Systems Neuroscience believe they have solved this mystery. Think of regular maps and how they relate to your surroundings. When we go hiking and orient ourselves with a map and compass, we align the map using the north arrow on the compass and match it to the longitude lines on the map, to align the map with the terrain and make sure we find our way (unless we have a GPS that does the work for us). ‘Right frame of mind’. Conceptual interpretation of results. The internal grid map of space must be anchored to the external geometry of the world. Forces act on the pattern (orange lines) to produce a final grid geometry that is most asymmetric in relation to the environment. Husserl would be proud. We know our brains contain a number of internal maps, all mapped onto the surroundings, ready to be pulled up to guide us in the right direction. These grid maps come in different sizes and resolutions, but until now they have offered few clues as to how they are anchored to the surroundings. The findings published in Nature this week explain the surprising twist the brain uses to align its internal maps. The researchers recorded the activity of grid cells in rats as the animals foraged for cookie crumbs in a 1.5 square metre box. Now, if a map, represented by the activity of grid cells, were to represent the box it would need to look the same every time the rat ran in the box. And it would need to be aligned the same way too, independently of which way the rat ran, and where the rat was put into the box. The recorded maps were indeed consistent. Each grid pattern was anchored to one of the walls. But none of the grids’ axes were perfectly aligned with either wall; they were consistently askew. The researchers looked into the connection between the rotation and anchoring of the grid, and the distortion of the pattern and found an almost perfect correspondence between the direction the ellipse was pointing and the direction the grid was anchored towards. By skewing the pattern along one of the walls – a process known as shearing– the researchers could replicate both the ellipse and the 7.5-degree rotation of the grid. The process of converting the sun’s energy into liquid fuels requires a sophisticated, interrelated series of choices but a solar refinery is especially tricky to map out because the designs involve newly developed or experimental technologies. This makes it difficult to develop realistic plans that are economically viable and energy efficient. In a paper recently published in the journal Energy & Environmental Science, a team led by University of Wisconsin-Madison chemical and biological engineering Professors Christos Maravelias and George Huber outlined a tool to help engineers better gauge the overall yield, efficiency and costs associated with scaling solar-fuel production processes up into large-scale refineries. That’s where the new UW-Madison tool comes in. It’s a framework that focuses on accounting for general variables and big-picture milestones associated with scaling up energy technologies to the refinery level. This means it’s specifically designed to remain relevant even as solar-fuel producers and researchers experiment with new technologies and ideas for technologies that don’t yet exist. “The nice thing about it being general is that if a researcher develops a different technology – and there are many different ways to generate solar fuels – our framework would still be applicable, and if someone wants a little more detail, our framework can be adjusted accordingly,” Maravelias says. In addition to bringing clarity to the solar refinery conversation, the framework could also be adapted to help analyze and plan any number of other energy-related processes, says Jeff Herron, a postdoc in Maravelias’ group and the paper’s lead author. Ph.D. student Aniruddha Upadhye and postdoc Jiyong Kim also contributed to the project. The research was funded by the U.S. Department of Energy. Wildfires send hot flames and smoke high into the air, including black carbon emissions associated with climate change and risk to human health. Unless the United States adapts sensible forest management policies, which means fewer instances of the Department of the Interior and environmental lobbyists conspiring to manipulate science reports, carbon emissions from wildfires in the contiguous U.S. could increase by 50 percent by 2050 and double by 2100. But high-profile wildfires should not be the only concern. Peatlands — an organic mixture of decayed and compacted leaves — are actually the largest fires on earth. These high-moisture-containing fuels make up nearly three-fourths of earth’s land mass and are believed to be the largest emitter of carbon from wildfires to the atmosphere. In 1997, a period of extreme haze caused by the spread of smoldering peat fires in Indonesia led to a rapid increase in respiratory illnesses and disrupted shipping and aviation routes, creating an estimated 0.81 to 2.57 billion tons of carbon gases in that region. Peat fires are difficult to extinguish, burn at a lower temperature, produce more smoke, generate particles that can be irritating to the eyes and respiratory system, and are among the least understood of fires, according to the U.S. Environmental Protection Agency. Unlike flaming fires, peatlands smolder underground for weeks and months and emit a whitish smoke. To study the climatic effects of carbon-containing aerosols emitted from peat fires, Rajan Chakrabarty, PhD, assistant professor of environmental engineering at Washington University in St. Louis’ School of Engineering & Applied Science, has received a grant from the National Aeronautics and Space Administration (NASA). Brent Williams, PhD, assistant professor of environmental engineering, is a co-investigator on the project, as is Wei Min Hao, PhD, an atmospheric chemist at the USDA Forest Service Fire Sciences Laboratory in Montana. With the new grant, Chakrabarty and his collaborators will study the origin of brown carbon particles, their chemical makeup, how many particulates are being emitted and determine their optical properties, or how they behave in light, using a photoacoustic technique, which uses non-invasive imaging based on sound and light. When scientists and engineers collect the smoke particles on a filter, the residue is yellow to brown in color, giving clues about its properties, Chakrabarty said. Chakrabarty and Williams will study laboratory-scale fires from peat fuel types found worldwide at the USDA Fire Science Laboratory combustion chamber using their real-time optical and chemical instruments, which they will transport to Montana in the summer of 2016. They will compile the results into a reference for other scientists, called a look-up table, which will provide researchers and climate modelers with properties for the different fuel types. Since NASA has the largest inventory of fire images from satellite, its scientists will integrate the look-up table into several of its satellite algorithms and climate models, Chakrabarty said. Chakrabarty first studied brown carbon particles as a graduate student at the University of Nevada, Reno, in a pilot study at the USDA Fire Science Laboratory. He observed large-scale brown-carbon aerosol being freshly emitted as primary particles from smoldering combustion of two kinds of duff, or the surface organic layer containing litter, lichen, live and dead moss and organic soil. The combustion of duff is the largest contributor to smoldering smoke production in forest regions in the Northern Hemisphere and contributes between 46 percent and 72 percent of all wildland fire carbon emissions annually.